Instructions: Create a tent fold card base from white card stock using the 4.0" x 5.25" rectangle from the Eyelet Rectangle and Basics Die. 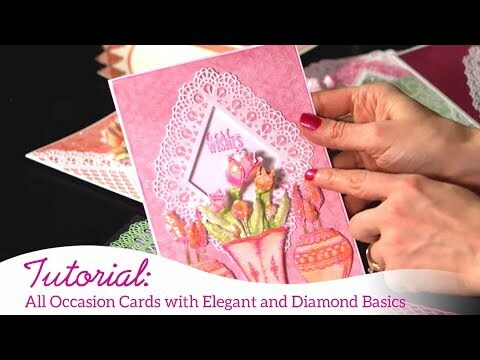 Next, die cut the Diamonds and Lace Die also from white card stock. Adhere it to card base. Ink all edges using a combination of Ranger Archival Ink - Coffee and gold ink to give an aged appearance. Choose the size eyelet diamond die you wish to use for sentiment background. Die cut from gold card stock and set aside. Locate coordinating sized diamond die within the Diamond Basics Die and die cut from white card stock. Using Ranger Archival Ink - Jet Black, stamp sentiment from Cheerful Note Sentiments Cling Stamp Set. Ink all edges using same color combination used on card base. Sprinkle Embossing Enamel - Aged Ivory lightly using finger tips to areas on sentiment diamond you wish to add some antiqued texture. Working from the backside of the diamond shape (as to not blow embossing enamel off of die cut), melt embossing enamel with heat tool. Adhere sentiment diamond shape to gold eyelet die cut. Using dimensional foam tape, adhere to card base. Repeat same embossing enamel technique to various spots on card base. Stamp one inking of each of the opposing pansy sprays from the Delicate Pansy Spray Cling Stamp Set onto white card stock using Ranger Archival Ink - Jet Black. Stamp one inking of each size of pansy petals and foliage illustrations from the Cheery Pansy Cling Stamp Set. Using Stack and Store Daubers, color all pansy centers using Ranger Archival Ink - Sunflowers, Ranger Archival Ink - Forget-Me-Not around centers, and Ranger Archival Ink - Deep Purple on petal tips, working the blue and purple colors into one another. Using Stack and Store Daubers, color all foliage with Ranger Archival Ink - Olive. Die cut all stamped images using coordinating dies. Using Stack and Store Dauber, apply a hint of Ranger Archival Ink - Coffee to all petal pieces and pansy sprays to give them a vintage feel. Using 3D Pansy Shaping Mold, shape one large, one mid-sized, and one small pansy, along with both sizes of foliage. Assemble following video link above. Shape pansy sprays slightly using Deluxe Flower Shaping Kit. Adhere one pansy spray to top corner of card base as shown, and the other spray to opposite bottom corner. Adhere the large foliage and large dimensional pansy to top floral spray. Adhere mid and small sized dimensional pansies, along with smaller foliage to bottom floral spray. Using a fine metal glue tip and Dries Clear Adhesive, apply Crystal Ultrafine Transparent Glitter to all pansies and foliage, and prills to pansy centers.